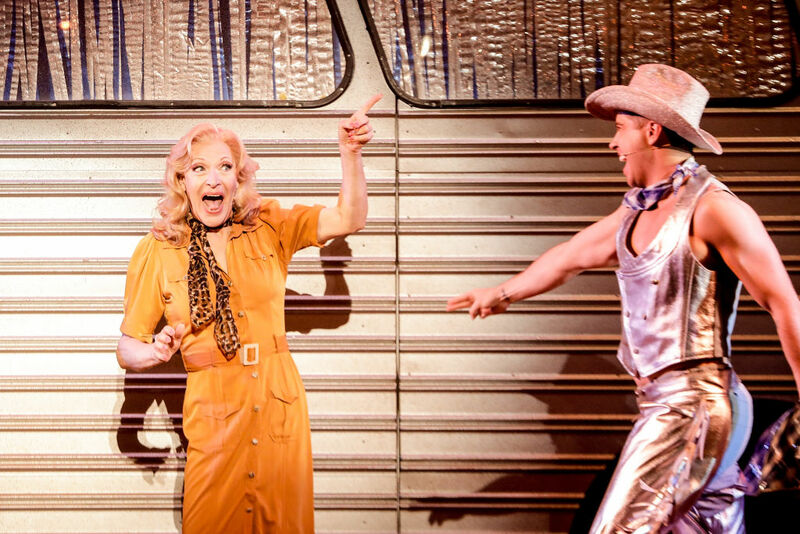 Having been embraced upon the world stage, Priscilla Queen of the Desert makes a welcome return home for a tenth anniversary victory lap of Australia. 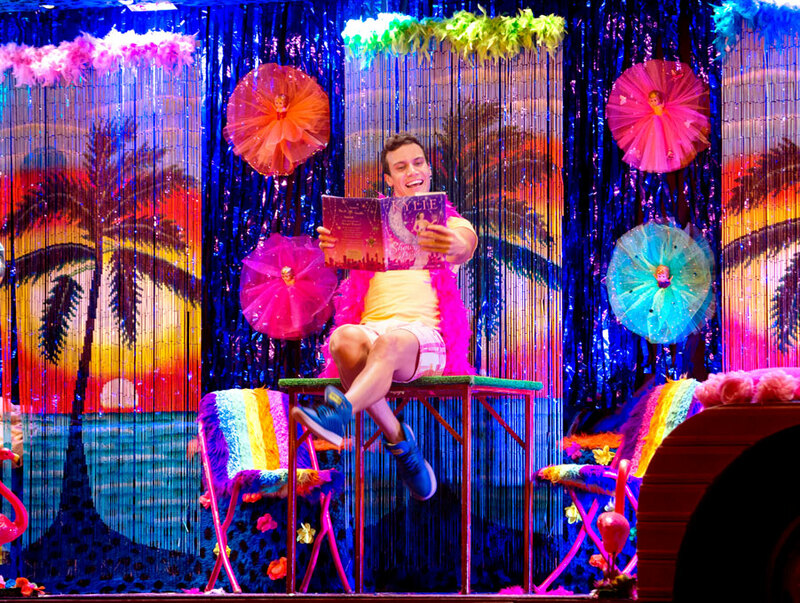 A rather decadent guilty pleasure, the show is as glossy, tuneful and cheeky as remembered. 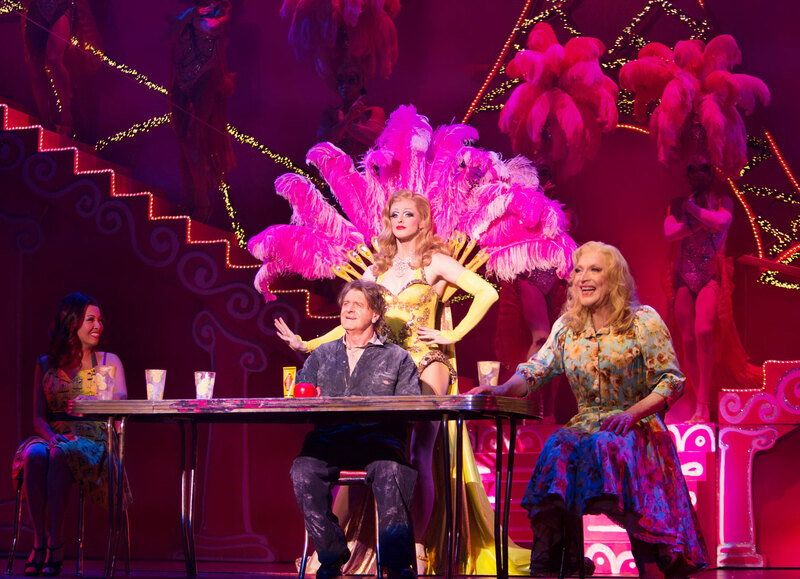 If Priscilla Queen of the Desert the Musical drew on nostalgia and affection for the 1994 movie, this return season now has additional nostalgia and affection for the impact and enjoyment of the musical’s original 2006 production. A significant note of pride should also be added to the mix, with the musical having played in an extraordinary list of countries. 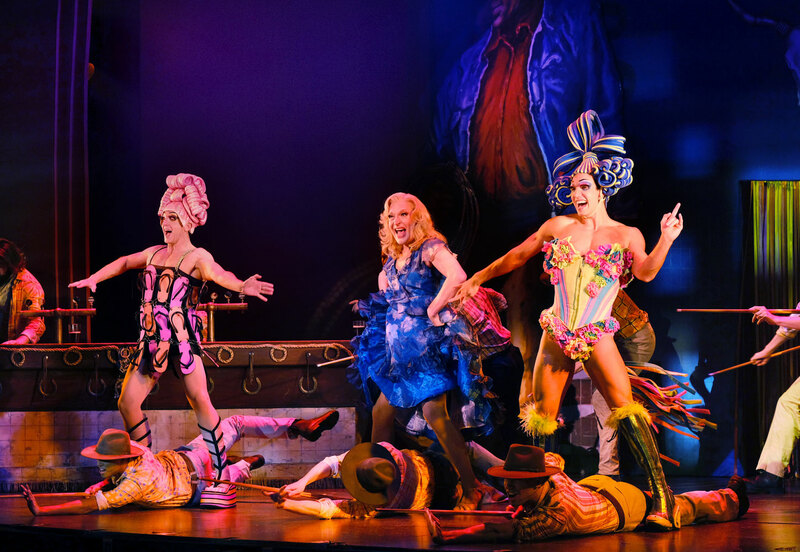 As well as boasting an utterly infectious score of perky pop songs, the return season of Priscilla Queen of the Desert brings back its wardrobe of incredibly lavish, eye-popping costumes. In terms of inventiveness and sheer numbers, Tim Chappel and Lizzy Gardiner’s costume designs fully retain their dazzling impact; a feat of this scale has not been matched in the intervening years. The original production team returns for this anniversary season, in which only the smallest of tweaks have been necessary to keep the show in prime condition. The degree of verve and vivaciousness in Simon Phillips’ direction keeps the laughs flowing and the action engaging. An aspect of the show’s quality has always been that affecting, intimate scenes sit alongside the big show-stopping moments. Without this heart, no amount of disco and drag would raise the status above that of a hollow spectacle. The original playlist has been slightly altered in the passing years. “It’s Raining Men” is a more potent opener than the more downbeat pairing of “Downtown” and “I’ve Never Been To Me.” With a strong focus on Felicia’s Kylie obsession, “Better the Devil You Know” easily replaces “Venus” as Felicia’s first number. I preferred the three leads reflecting on their first exposure to country attitudes with “Both Sides Now,” but the majority of audiences will surely be just as happy with “True Colours” in this moment. Priscilla Queen of the Desert looks terrific in the mighty Regent Theatre. Designer Brian Thomson meets the challenge of portraying the vast Australian outback by beginning with a claustrophobic feel for the city before opening to a full stage of hazy red back drops. Priscilla herself remains Thomson’s star achievement, and she (the bus) now has the added technology of a skin that is an LCD screen, allowing all manner of colours and images to be displayed. Reflecting changes in somewhat smaller spaces overseas, the staging now has a front travellator rather than a full revolve. When Felicia boards the giant silver high heel for her iconic opera therapy, the shoe no longer moves out over the heads of the front row. One last change sees the three leads no longer able to stand on top of the bus together; this not only reduces the climactic climb of Ayers Rock to a simple scene on stage level, but also, more disappointingly, robs the three leads of their full applause as the audience is not aware of who they are when they walk on stage in the curtain calls rather than appearing atop the bus. Ross Coleman’s legacy lives on in the niftily joyful choreography. His audience participation practical joke at the top of act two remains a delightful moment. Andrew Hallsworth, now co-choreographer, responds to the increasing talents of Australian musical theatre performers with an additional degree of difficulty along with characteristic wit. Australian theatrical royalty, Tony Sheldon returns to play Bernadette, the role he created here and played on Broadway and the West End. Sheldon’s finely honed performance is an absolute joy. His comic timing is immaculate, and he has the ability to flip from a withering put down to raw compassion in the blink of an eyelash. Sheldon has shaped the role from the grittier portrayal in the movie to an endearing character of tender humanity, making the show all the richer. All this, plus the energy and agility of the cast’s full set of twentysomethings put together. David Harris returns to Australia to play Tick/Mitzi, the role with the strongest and most emotional arc. The legalization of gay marriage is a massive societal shift since the show was created, but the concept of a father who feels uncomfortable for his young son to be aware of his drag career is still convincingly tense. The son’s guileless reaction, of course, humbles all of us. Tick’s vocals benefit immensely from Harris’ richly burnished musical theatre tenor, which is a pleasure to hear again. In a role seemingly tailor made for his talents, Euan Doidge fully inhabits mischievous sprite Adam/Felicia, bringing an extra level of dazzle with his brilliant dance skills. Adam sets out to be annoying, and Doidge expertly balances the brash aspects of the character with a raw, endearing vulnerability. Robert Grubb captures the characterful warmth of everyman Bob. Emma Powell proves there are no small roles as buxom bogan Shirley. Lena Cruz returns to the audacious role of “talented” mail order bride Cynthia, a role that could potentially be a cringe worthy stereotype in lesser hands. Angelique Cassimatis, Samm Hagen and Clé Morgan deliver powerhouse vocals as the three Divas, always leaving the audience cheering for more. Full credit to the entire company for pulling off the complexity of playing a multitude of chorus roles, not only singing and dancing up a storm but also moving swiftly a mind boggling number of costumes and styles. Recent new Australian entry Muriel’s Wedding has the added benefit of an original score. 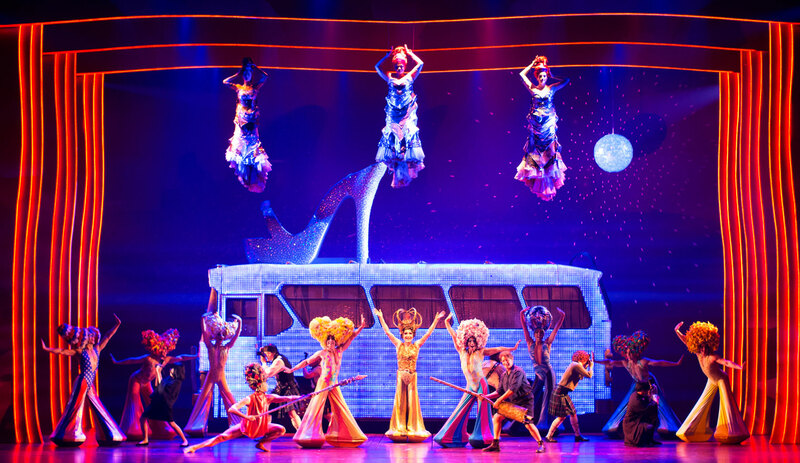 While we eagerly await our wedding invitations, Priscilla Queen of the Desert is a guaranteed blast of theatrical pleasure. Priscilla Queen of the Desert shakes her groove thing at Regent Theatre, Melbourne before touring to Sydney, Adelaide and Brisbane. I have just seen this in Adelaide Simon and somehow having missed it the first time round I thought the whole production was terrific. Understudy David Spencer did a tremendous job with Bernadette. David Harris just gets better and better with his spot on Tick and Euan Doidge, after what I thought was a pallid turn as Marius (aka Jonas ) in Les Miz, has returned to his Chorus Line acting stripes. Not having seen the original production I was very interested in your comparative comments. Adelaide used a revolve and the travellator but if one scene did not work for me it was the diva on top of the bus. Audience members in closer seats lost its impact completely. The scene transitions were smooth and faultless. I loved the re-invention of the classic A Fine Romance, probably lost on younger audience members.Amazing how such a spectacular, wide show could become intimate, moving and effective with Tick doing Elvis for his son. Glad you enjoyed Priscilla, Edward. There is a genuine likability in the show that has helped to make it a worldwide hit. The intimate moments are quite extraordinary given the large scale nature of most of the numbers. Any chance you could go back to see Tony Sheldon as Bernadette? David Spencer is very good but it is the role of a lifetime for Mr Sheldon, and he has turned it Into his signature role. Yes I have already booked for the final night in Adelaide …..hopefully Tony should perform then although he didn’t do either of the last Wednesday shows. Refreshing that for Opera Australia’s Evita they have been fully transparent regarding when Gemma Rix will be performing the title role. Hope this catches on for other musical theatre events as the producers generally know the cast substitution dates well in advance.